Mr. Movies Entertainment has been operating in its current location since February 2007. In April 2014, the store was going to be closed under the previous corporate ownership. 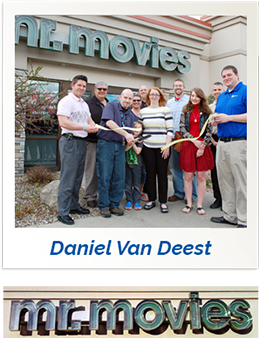 Daniel Van Deest and his wife Angela Nuss recognized the importance of having a small, family-owned video store in Brandon, SD. Daniel has had over 30 years of retail experience in movies, music, and video games dating back to Musicland/Sam Goody/Suncoast Motion Picture Co. through Walgreens, Pet Smart, and Best Buy. Daniel likes to make the environment of Mr. Movies Entertainment a fun and inviting atmosphere, while also making it a family-friendly experience. With so many choices available to customers (digital subscription services, video vending machines, etc), it is important for Mr. Movies Entertainment to make customers feel welcomed. SSS: What are your biggest reoccurring challenges you have in your store? MrM: At Mr. Movies our biggest challenge is having enough products on hand while also remaining profitable. Also finding vendors and suppliers that are able to help small business owners. SSS: What is your long-term vision for your store? MrM: We would love to continue to grow our business and customer base, while working on reclaiming customers that have grown disenchanted with monthly entertainment services, because those services don’t provide a true value. We want to go back to the roots of video rental when a trip to the video store was a family adventure and an outing. MrM: We have worked very closely with our Chamber Of Commerce, which provides great alternative marketing options. We have also had solid success with focused Facebook postings. MrM: We have designated Daily Specials, which allow customers to get a great deal, no matter when they stop in. For example: Friday’s Daily special is Munchies! 3 movies and 3 candy/pop items for $11.99. Another special is Wacky Wednesday Rent 1 and Get 1 free on all Movies and Video Games. MrM: Sincerely thank every customer that walks through the door. The importance of making your customers feel welcome and taken care of is the best form of marketing. SSS: How do you keep up with the trends? MrM: My business changes every week, since new movies and games come out every week. That means I need to know what is popular, what customers are talking about or looking forward to, and making the necessary selections. SSS: What is your favorite product from Specialty Store Services? MrM: Customers absolutely love the Popcorn Popz Tubs!